United Media SVP/General Manager Lisa Wilson, reporter Helen Thomas and cartoonist Mikhaela Reid at the Bush Leaguers political cartoon opening at American University in DC. I'm finally going through my 200+ photos from the Association of American Editorial Cartoonists 50th Anniversary convention in DC earlier this month. I'll have writeups and a lot more soon, but here's one of my favorite photos, of Lisa Wilson and myself with reporter Helen Thomas after Ms. Thomas gave one of the best speeches I'd ever heard. 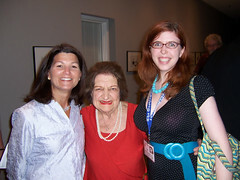 Helen Thomas for president! oh god, one of me in your flickr set looks like I have some kind of walking disorder. I know, I know Matt. I have to caption that one in a funny way. At least it's just one photo Matt. I look I'm suffering from some form of Asperger's in nearly all of them. What did Ms. Thomas talk about? Greg, she talked about everything--her disgust with the Bush administration, her experiences reporting during the terms of every President since Kennedy, the war, health care, poverty, you name it. She was amazing. Sounds awesome. I've pretty much only heard her ask questions.